Our department was born out of the need to provide a home for academics who wanted to study the use of technology rather than to focus on the creation of it. Technology is rapidly transforming our world, and that makes any study of technology and its impacts far from a passive pursuit. Indeed, information science is inherently nimble, adaptive, interdisciplinary, and relevant. The Information Science department at Cornell embodies these characteristics. Jon Kleinberg, professor of computer science and information science, teaches a 2017 Networks class. Our department was born out of the need to provide a home for academics who wanted to study the use of technology rather than to focus on the creation of it. Starting as an interdisciplinary minor in 2002, Information Science grew into a full-fledged major graduating the first five students in 2005. Our growth since then has been nothing short of extraordinary. Today, the Information Science department offers undergraduate degrees through the College of Arts and Sciences, College of Agriculture and Life Sciences, and College of Engineering, as well as Master of Professional Studies (MPS) and PhD degrees. The new Cornell Tech campus in New York City also offers Information Science master's programs in Connective Media and Health Tech. Human Computer Interaction (HCI) involves the study, planning and design of the interaction between people (users) and computers. Design includes the study of web, software and application design and development as well as user experience and interaction studies and creating prototypes of new technologies. Working with Data involves many aspects of information science from working with databases to developing websites to studying big data. Information Policy is the study of the laws, rules and policies that have developed from the proliferation of new technologies and the ways that people use them. Behavior and Technology studies integrate tools from the fields of psychology, sociology and communication, allowing researchers to analyze the ways in which people interact with technology and how that interaction affects their individual well-being, their relationships and society as a whole. Formal Analysis of Social Systems courses allow students to apply social science research methods to problems of information science, looking at how new media and digital technologies are sharing culture and social institutions. Natural Language Processing studies ways to improve a user's ability to find, absorb and extract information from online text. 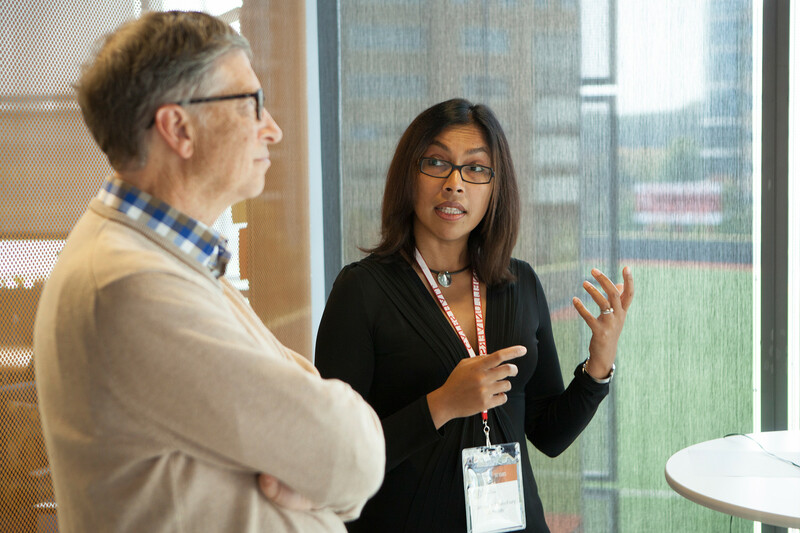 Info Sci Professor Tanzeem Choudhury talks with Bill Gates during his visit to the Cornell campus. We’ve come a long way from five graduates in 2005. Information Science currently has around 350 undergraduate majors enrolled across all three schools, nearly 100 master’s students and about 60 PhDs. We have about 40 faculty members appointed to Information Science – including Cornell University President Martha Pollack, a leading scholar in artificial intelligence – and many affiliated faculty members who work with our students from other “home” departments, like Computer Science, Communication, and Engineering. 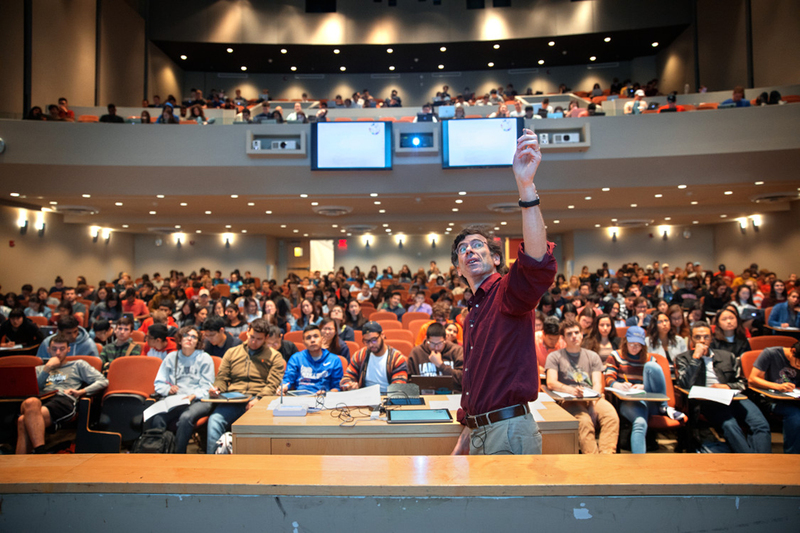 Committed to being a home to a diverse community of scholars, Cornell Information Science takes seriously Ezra Cornell's founding principle of "any person, any study" and believes that multiple perspectives enhance creativity. Our students are equipped with the necessary skills to be game-changers in today’s workforce, and have gone on to jobs with many of the major tech and social media companies, such as Microsoft, Apple, Facebook, Verizon, and Yahoo. Others have joined start-ups, formed their own, or volunteered their time at not-for-profit organizations. Our faculty and students are leading the exploration of everything from ethical issues in machine learning and data science, to how technology can (and can’t) help with deep societal problems such as sustainability. With the official dedication of the Cornell Tech campus in September 2017, Information Science grew from one homebase to two. Located on Roosevelt Island in NYC, Cornell Tech continues Information Science’s tradition of forward-looking research and bold, audacious collaboration. Cornell Tech-based faculty members like Mor Naaman, Helen Nissenbaum, James Grimmelmann and recently hired Wendy Ju are leaders in their respective fields of social computing, privacy and law, and design. Though we are two campuses, we are one Cornell. 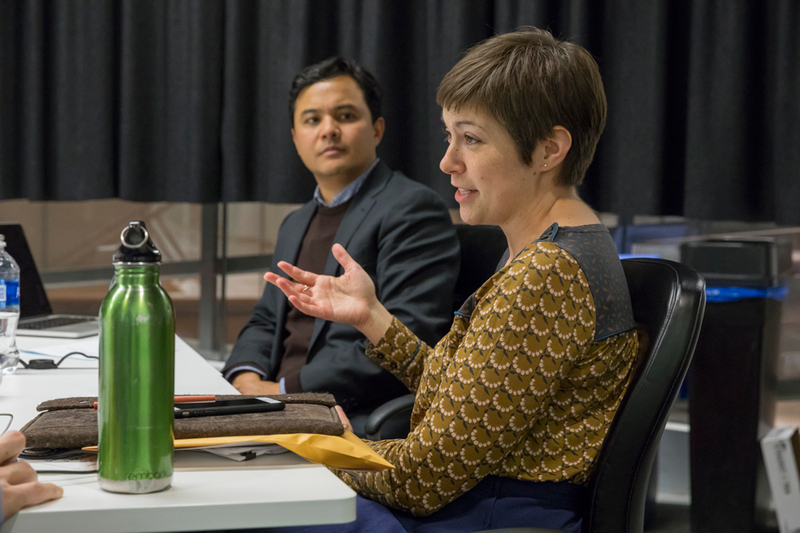 Information Science Assistant Professor Karen Levy leads a student discussion in her Tech/Law Colloquium course, while invited speaker, Mark Latonero, lead researcher at Data & Society, looks on. To Cornell Computing and Information Science Dean Greg Morrisett, scholars within Cornell Information Science are out to better understand the dynamics between us and the technology we use. "All too often we get excited about developing and fielding new technology without fully understanding the societal implications. Cornell’s Information Science focuses on how humans use and interact with technology, how they are impacted by it, and how we can design technology to better serve humanity," he said. "Our faculty and students are leading the exploration of everything from ethical issues in machine learning and data science, to how technology can (and can’t) help with deep societal problems such as sustainability." In the area of research, our faculty and students explore the social, cultural, economic, historical, legal and political contexts of technology, approaching information studies from a variety of different fields and looking at the individual, social and institutional impacts. Innovators in our department guide the field in areas like human-computer interaction, robotics, social networks, and tech-law policy, and shine at major conferences like CHI, UbiComp and CSCW, to name just a few. Information Science professors Cristian Danescu-Niculescu-Mizil and Lillian Lee, along with Computer Science PhD Liye Fu used natural language processing models to discover gender bias in coverage of women’s tennis. A NSF CAREER grant recipient, Info Sci Assistant Professor David Mimno applies computation to the humanities and the social sciences. One of his current projects is finding new and better machine-learning methods to broaden our understanding of data analytics and possibly tap into million-book digitized libraries that currently lay just beyond our grasp. An example of our department’s compatibility with other fields, Info Sci assistant professors Solon Barocas and Karen Levy, together with collaborators in Cornell Ag & Life Sciences (CALS), are exploring the social and policy considerations involving farmers’ use of digital ag tools. What concerns do farmers have in using data-intensive farming systems? What are the privacy and legal ramifications of their use? These are some of the questions researchers intend to answer. Researchers in the Info Sci-based Robots in Groups Lab study how robotics can facilitate healthier group learning among adults and children, while in the People-Aware Computing Lab, our faculty and students develop mobile sensing systems that improve people’s well-being and quality of life. One such system, under the direction of Associate Professor Tanzeem Choudhury, grew into a start-up company called HealthRhythms, which aids people with bipolar disorder and is currently in use by health professionals in a major, East Coast hospital. Choudhury serves as founder and CEO of the company, which employs several Info Sci alums and affiliated faculty. Info Sci faculty, PhD and master’s students teamed up to build RoMA, the very first system that combines augmented reality and fast 3D printing. Billed as “in-situ fabrication”, the system allows the designer to build a 3D model in real, physical space and has a robotic arm to print the design at the same place and time. Our research is published regularly in both mainstream press and academic journals, and our experts in the field have been interviewed by The New York Times, ABC and CBS News, NPR, and Vox, among many others. These are just a few examples of the work that happens within Cornell Information Science. For more information see our Research page and for lists of publications, please visit individual profiles under our People page.